Portrait guitars express and immortalize an individual. These custom guitars have become a specialty for Ted. They allow him to creatively endow a unique instrument with personal meaning – for himself and others. They can become beloved, personalized treasures for generations. In 2012, Imelda – a fan of Megas guitars and Ted’s personal friend since 1986 — passed away suddenly. Imelda had long intended for him to build her an archtop, but never fulfilled her dream. After her passing, Imelda’s closest friend decided the best way to memorialize Imelda would be to commission Ted to build her dream guitar; to build it in her memory, with funds from her estate. Imelda’s friends and Ted collaborated to choose guitar elements that would create a fitting portrait to Imelda. Like Imelda, her portrait guitar honors nature and simplicity. She loved the outdoors and natural woods. Imelda appreciated simple things: being together in the moment with dear friends, without pretension. She was non-materialistic. Even so, she had a quirky, delightful sense of humor and an appreciation of the exotic. He aimed for a simple, balanced beauty in a graceful instrument in keeping with her tastes. 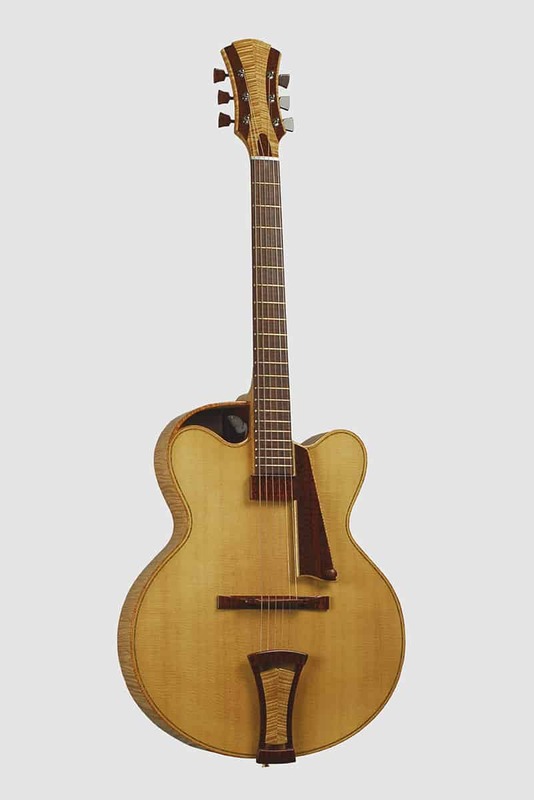 Ted added a unique design: a soundport mimicking the shape of the upper cutaway. The soundport is positioned to amplify sound up to the player, rather than out to the audience as most f-holes point. And the player can view the inside of the guitar through this soundport -- and see the otherwise hidden inlay of an egret. This was Imelda’s favorite bird, one she often saw during walks with dear friends. 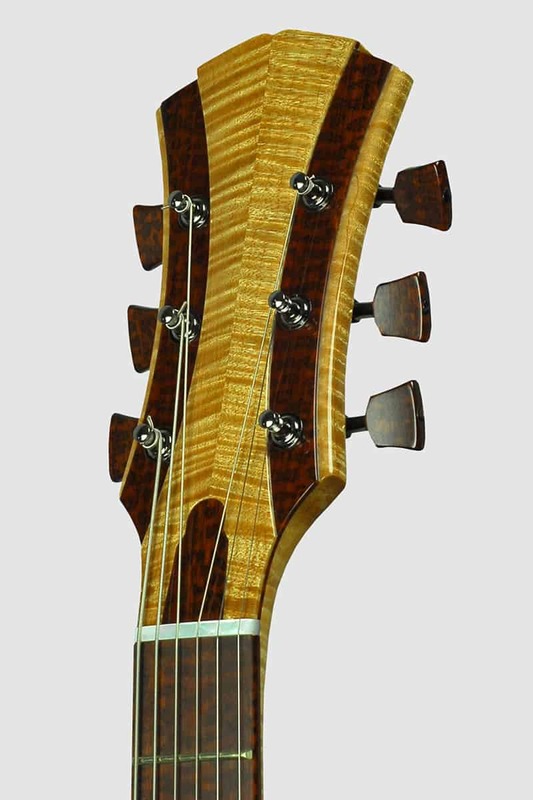 Carefully selected, exotic snakewood is used throughout, including the custom peghead, tuning buttons, the lightweight tailpiece, and the handmade bridge thumb wheels inlaid with snakewood. 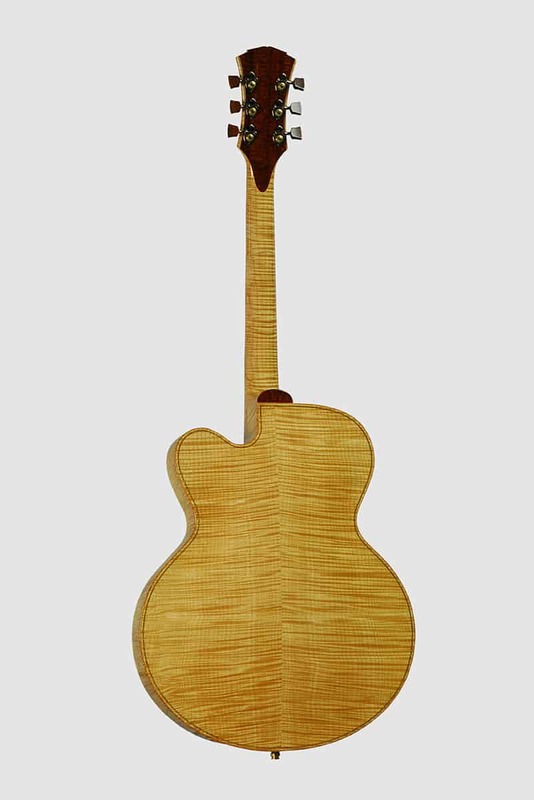 The flush inlaid peghead tuss rod cover is held on by a magnet instead of an overlay held by screws, to expand the natural appearance of the guitar elements. The instrument made its first public appearance at the 2013 annual Handmade Musical Instrument Exhibit at Marylhurst University near Portland, Oregon.